I am anti-wasting, especially when it comes to food. This is due to what my elders inculcated in me at a young age: wasting food is wasting hard-earned money and wasting food is taking for granted our good fortune in life when other people in the world are going hungry. As an adult, I’d also become aware of the negative impact of food waste to our environment. The Coursera Interaction Design Capstone Project course led me to explore my passion against food wasting. It led me to design an app (and a planned suite of apps) that facilitates behavioral change: a change from the act of throwing away food to the act of throwing away the habit of wasting. It led me to design Waste Away. 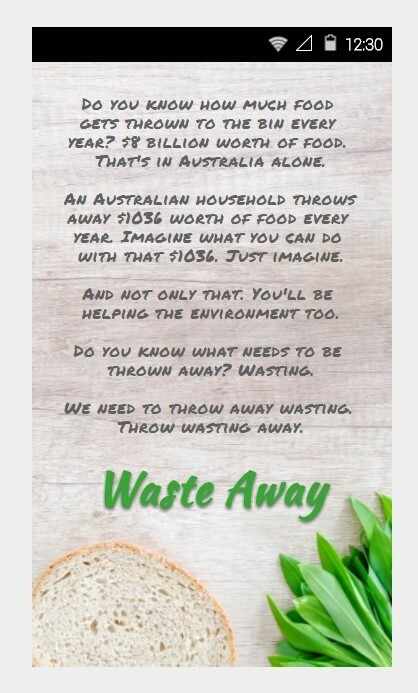 An average Australian household throws away $1036 worth of food every year. That’s $1036 worth of money lost. That’s also $1036 worth of contribution to the greenhouse gas emission that damages the environment. Food is mistakenly thrown out before the use-by/best before date. We don’t check the cupboard/fridge before going shopping. We buy too much because we don’t stick to a shopping list. There should be a way for people to eliminate or at least reduce or minimize their household food waste. After 10 weeks of interviews, ideation, storyboards, paper prototypes, digital mock-ups, heuristic evaluation, and user testing, the Waste Away app is completely designed. The Waste Away app has three main features: a shopping checklist, an inventory of one’s pantry, and a statistics of one’s waste. It provides a seamless experience between the features with the important capability of notifying the user when food items are expiring or when food items are still available in the pantry when adding it to the shopping list. This facilitates the behavioral change towards avoiding food wasting. The app is designed to be simple and straightforward as it is targeted to a wide demographic including non-tech savvy people who use a smartphone. The Waste Away app is very different to what I originally envisioned it to be at the start of the project thanks to the UX design process that I adhered to. Through storyboards, I was able to exercise the applicability and usefulness of both design ideas. The storyboards strengthened my belief that there’s value in the design ideas that I selected because the user needs are addressed. 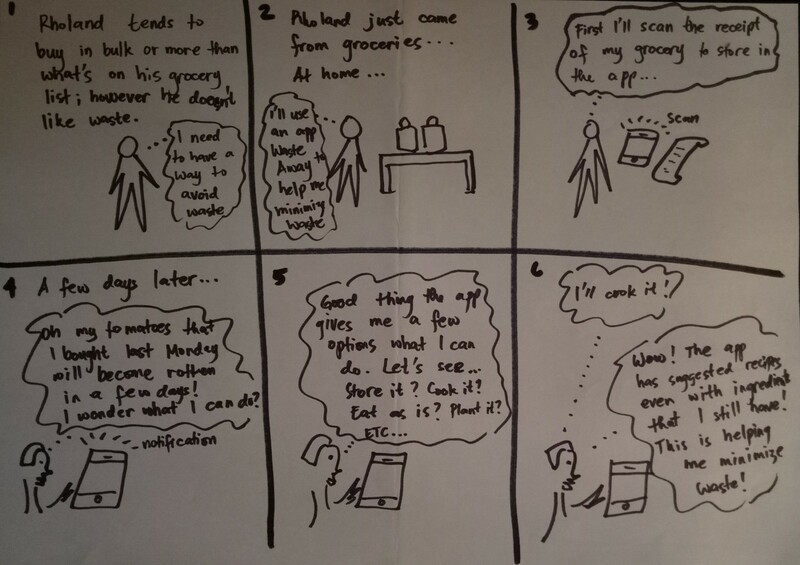 One of the storyboards from the early stages of the design process that led to the Waste Away app. I then created paper prototypes of the two design ideas. 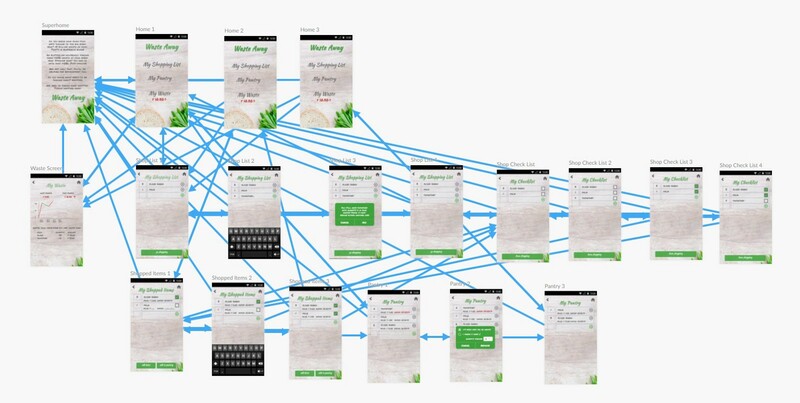 The prototypes, which were loaded in the mobile tool POP by Marvel, allowed me to quickly test the design ideas with actual users while noting usability issues using Jakob Nielsen’s 10 Usability Heuristics. Through this process it became clear that the second idea’s simplicity and usefulness made it the sensible option to proceed with compared to the first idea’s task intensiveness, which was unappealing even to a tech-savvy test user. The Waste Away app was finally taking form with the second design idea as the base design along with a few modifications, mainly, the addition of the shopping list functionality from the first design idea. With a digital mock-up done in FluidUI, I created a fully interactive app, which was used in a controlled and systematic in-person usability testing. This process allowed me to observe and learn the users’ breakdowns, which then became the basis for creating an alternative design to address the breakdowns. Since the breakdowns during the in-person testing were inconclusive due to the small number of participants, an AB testing was done at usertesting.com to test if the breakdowns would occur in the original design with different users and whether the alternate design solved the breakdown. The testing was done on a controlled and systematic manner with the two design apps having only one difference to identify whether the design change indeed solves a breakdown. A tester in usertesting.com exhibiting the breakdown that was observed during the in-person usability testing. The AB Testing confirmed what I found during the in-person testing and paved the way for me to finalize the Waste Away app using the alternative design. I was also happy that the feedback during the AB Testing from the testers regarding its usability was positive with comments such as the app was easy to use and straightforward. With a few revisions especially on the aesthetics based on the feedback from both the in-person testing and AB testing, the Waste Away app had been finalized. While it is not functional as the app is not implemented yet, it is fully interactive that allows a user to go through the screens as tasks are done. 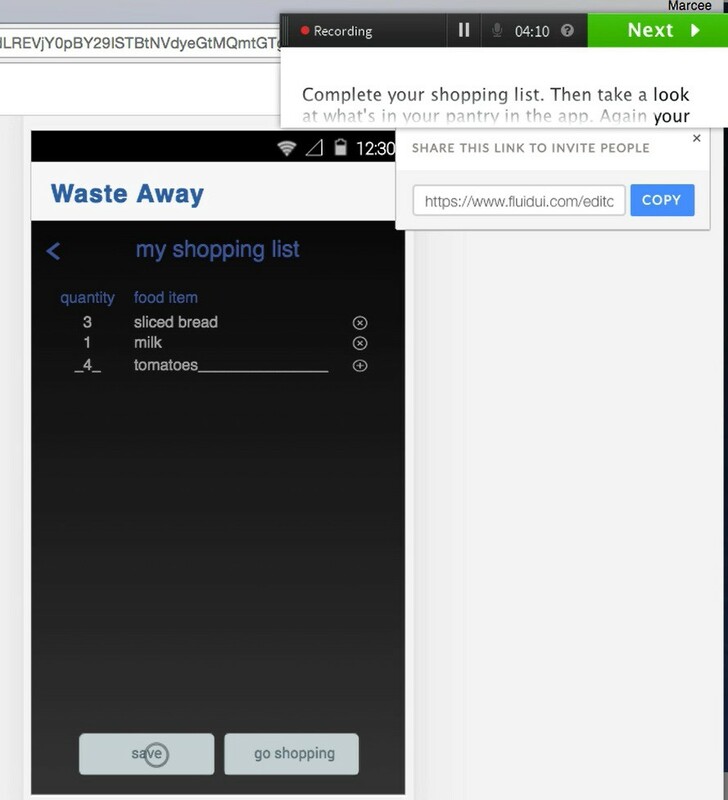 The full interactive Waste Away app done using FluidUI. The entire design process had been done following a development plan which aided me in not missing any important activities and deliverables. While the app is itself complete and achieves its purpose, it will be extended to further create a micro circular economy for users by facilitating effective consumption of food and management of waste in their household. In the greater scheme of things, I envision the Waste Away app to be extended further to create a macro circular economy by engaging grocery stores, customers, and beneficiaries such as farmers, putting all in a win-win situation along with our environment. And in an even greater scheme of things, I envision the Waste Away app to be not just one app but a suite of apps that address different wasting habits, not just in the form of food wasting but also in skin products wasting, electronics wasting and clothing wasting. With time, resources, and proper approach to designing, a suite of Waste Away apps can address our wasting habits. While designing the Waste Away app, I discovered the areas in UX Design that I’m interested in and want to specialize in, namely, in needfinding and research, synthesis of insights and ideation to come up with design solutions, user testing, and to some degree content and information architecture. I’m the first to say that I would like to work with someone who does the visual design. I believe in teamwork and therefore I believe that my vision on the future of the Waste Away app depends on the interest and support of people with varied expertise. I call upon individuals, organisations, and most especially social enterprises to look into the promise of Waste Away. Let’s talk!